The BellaOnline Mused Literary Review offers poetry, short stories, artwork, non-fiction works, plays, and interviews each quarter. The magazine is offered in ebook format for free! This gorgeous, formatted PDF is a delightful way to enjoy each season of the year. 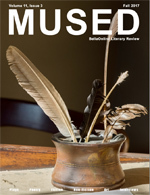 Mused is published on each solstice and equinox. Autumn is a season for counting our blessings. For realizing just how much we have in life where so many others are without. It can often be easy to take things for granted. Things which millions of people desperately dream of having. By pausing for a moment, and looking around with mindfulness, we can find a new center. Begin with fresh energy. Artwork takes us on this journey of appreciating the beauty in every day. The shimmering violet of a flower's petal. The rich glow of autumn foliage. The masterpiece of a luminous sunset. Poetry shimmers with vision. The delicate parasol of Queen Anne's lace. The coy flirtations of a luminous moon. The charcoal tears of raindrops in dust. Fiction draws us in to worlds which could easily be our own. A grandmother whose memories gambol and fade. A woman who relives the fears of a long-distant past. A young man who treasures every day he has left to him. Non-Fiction invites us into a fellow traveler's world. A woman meets her adopted daughter for the first time. A brother comes to terms with the untimely passing of a beloved sister. A woman's life takes a detour which strengthens her courage. A young girl survives a tragic accident and realizes she's lucky to be alive. We are all on this big blue marble for the fleetest of moments. A few whirls around a star and our journey is complete. There is so much to treasure in every day. There are so many fellow humans we can gently touch and lift up. If only with a smile - if only with a kind word.